This post is about the expected longevity of european men and women. But it is also about the interpretation of a simple linear relationship. The chart shows the relationship between the expected longevity of men and women in the various european countries. As we can see, they are highly correlated. Which is a good thing: it means that in countries with favourable life conditions, both sexes can profit. We also observe that women live on average longer than men. In no country men’s average life span surpasses 80 years, whereas this is surely the case for women in most countries. 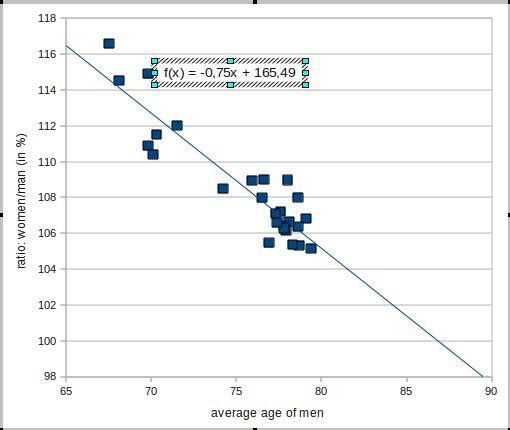 Next chart shows the ratio (in %) between life expectancy of women and men as related to average life expectancy of men. 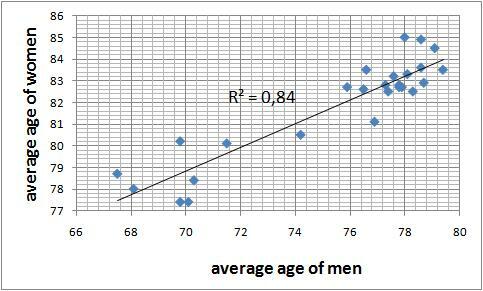 the ratio goes down as men live longer, meaning that the advantage of women decreases, that men catch up. We see approximately the same relationship, although the points are somewhat more scattered around the line. The equal-life-expectancy is situated here at about 91 years. Not exactly the same as in the previous graph, but let’s not quarrel about trifles. 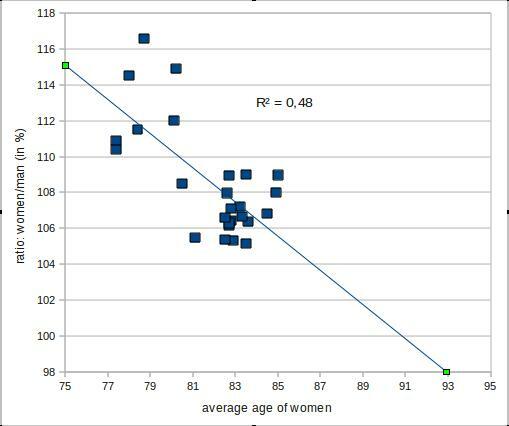 Conclusion : if life conditions would continue improving until the point that women (or men) reach an average age of about 90 years, they would have an equal live expectancy. We could state the above otherwise : as women seem to have an advantage over men, an improvment in life conditions favours men more than women, such that at an average age of 90, the disadvantage of men would be wiped out. Remains the question : what is the actual advantage that women have over men? Why do they live longer? In this article on Time Health reasons as “women develop cardiovascular diseases 10 years later than men”, “women have two X chromosomes which give them more genetic material and hence more diversity, resulting in an advantage”, “men have something like a testosterone storm when they are around their 20’s which makes them often behave dangerously”. Another aticle in Dalymail speaks about a genetic advantage of women over men because men are more disposable. Women (especially long ago when we were gatheres-hunters) had to live long enough to raise their children. And this article from Harvard University points the finger on the menopauze which cause women to stop giving birth to children. This gives her time to care of their children and grandchildren. So the next question : why does the age advantage of women decrease in countries where it’s better to live? Does her genetic advantage decreases? I believe that it’s something else. In the better countries, social structures, health care etc. are so much better that the environmental dangers decrease: better health care, safer cars, safer toys etc. diminish not only the genetic advantage of longer living mothers and grandmothers but also diminish the danger caused by the testosterone storm. So if there is no danger any more, the danger-countermeasures that women have, would become worthless. What happens then, when in some country both men ande women would reach an average age of 90? That would perhaps be the indication that all avoidable dangers, accidents, crimes, deseases, or whatsoever have been removed by adding the necessarey the infrastructures and countermeasures. This would then be an ideal country (from the point of view of longevity) where the only deaths would be old age or incurable deseases that make no difference between the two sexes. Any other ideas, interpretations? Do not hesitate, I will gladly read your comment.